Tappo is a PocketPC application that can be used by a drummer or band leader to manage song lists and tempos. The display shows the tempo of the current song and flashes on and off with the beat. It also shows the name of the current song in green and the next song in blue, so you know what song is coming up next. The drummer or band leader can hit the Next button to immediately switch to the next song and tempo, and count it right off. No standing around waiting between songs to look up a tempo and "dial it in". A song tempo can be entered numerically or by using the up and down buttons. In addition, you can tap the display to the beat of a song and Tappo will set its tempo to match your tapping. Very cool for determining the tempo of a song as you are listening to it on a CD or the radio. The buttons are designed to be tapped with a drumstick or finger for easy use while performing live, and the display colors are designed to be easily seen in stage lighting. Tappo uses an XML data file to store the song lists and tempos. You can also enter the key of a song along with the song name so you can see what key each song is in. Tappo runs on PocketPC or WinCE devices, and requires the .NET Compact Framework to be installed. See the link below. This version of Tappo is available to download for free! That's right, we won't charge you anything. What's the catch? Tappo does not come with any support. Tappo was written for our own personal use, and was entered into Microsoft's Will Code For Device contest as an example of how to write Windows Mobile applications using the .NET Compact Framework. We are making it available here in the hope that it will be useful to others. 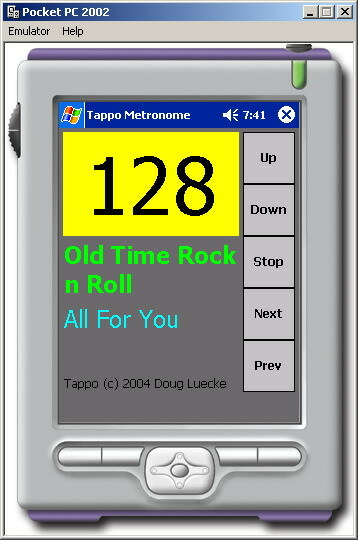 You are free to download and use this version of Tappo for your own personal use, either as a PocketPC Metronome, or as a tool for learning how to develop .NET Compact Framework applications. (See the source code download section, below.) However, we will not be actively supporting Tappo as we would if it were a commercially available product. We may, at some point in the future, decide to release a commercial version of Tappo. However, this version of Tappo will remain available to download for free. If you find Tappo useful, we would love to hear from you. Drop us a note at tappo@octix.com and let us know how you are using Tappo. Be sure to tell us what country/state/region you live in, what instruments and style of music you play, what type of device you have, and anything else that might be interesting. And don't forget to tell us what you find useful about Tappo. If you have any difficulties or questions about Tappo, we'd like to hear from you, too. We will at least read your emails. However, we can't guarantee that we'll have the time to resolve or look into them. ARM, ARMV4, MIPS, SH3, X86, and WinCE 4.20 X86. Ensure that your device has the .NET Compact Framework installed on it (see .NET Compact Framework, below). Note: The .NET Compact Framework must be installed on your device before you install Tappo on your device! Download the CAB file for your processor type by clicking on the name of your processor in the above list and saving the file on your computer. If you are viewing this web page from your PocketPC device, you may choose to Open the CAB file directly from the web instead of saving it on your device. In that case, you may skip Steps 3 and 4. Copy the downloaded CAB file to a temporary directory on your device. Note: The directory on your device to which you copy the CAB file is not important. When you open the CAB file in the next step, Tappo will install itself in the proper location so that it can be run from the Programs menu on your device. Click the CAB file on your device to open it and automatically install Tappo on your device. To run Tappo simply open the Start -> Programs window on your device and select Tappo in the list. The source code for Tappo is available as part of Microsoft's Will Code For Device contest. This version of Tappo is by no means the ultimate metronome. There are many things we can think of to add to it, and we're sure you can think of some, too. If you find any bugs or make modifications to Tappo, you are encouraged to share them with the .NET community. Please let us know what you've done and how you did it! If we all share a little bit and help each other out, we can make a difference in the world. If you do not have the .NET Compact Framework installed on your device, it can be downloaded from the Microsoft Download Center. Simply download the .NET Compact Framework Redistributable (NETCFSetup.msi), and follow the instructions on the webpage to install it on your device.